Yes, mystery buffs might argue that it's consistently outmaneuvered by ABC's Castle with regard for the sheer number of bizarre twists that occur in each case-long forty-two minute episode, nonetheless in its second and vastly superior season, CBS' diabolically clever Mentalist proves why it's still the best police procedural series on American network television. Yes, Castle 's eponymous, charming lead played by Nathan Fillion may make you smile far more often than the unspeakably blunt and purposely tactless CBI consultant Patrick Jane (Simon Baker). And similarly, The Mentalist doesn't revel in pop culture laced banter like its conceptually similar comedic twin Psych . However, the show clicks along more masterfully than the competition by ensuring that the supporting players are just as fascinating as the Sherlock Holmesian derived brooding hero who closes cases based on supremely heightened powers of observation as well as his keen psychologically intuitive insight into human behavior. Yet Jane isn't nearly as huggable or soft around the edges as the other men who have filled similar television shoes in the aforementioned series as instead creator Bruno Heller's conflicted protagonist has more in common with characters we've seen across the pond in Cracker , Murphy's Law , Touching Evil and others. As another brilliant outsider whom we can best tolerate and understand through the guidance and relationship of another outsider in the form of a female (a UK police procedural favorite standby), Jane has met his ideal match in Robin Tunney's tough but loyal Teresa Lisbon. Benefiting from the near-shorthand you get after you work with someone long enough, the friendly colleagueship that at times hints at romantic tension but mainly the unconditional love of a makeshift family unit via Jane and Lisbon's intriguing dynamic has grown stronger with time and is reflected in the way the entire supporting cast is stepped up in this five-disc installment. 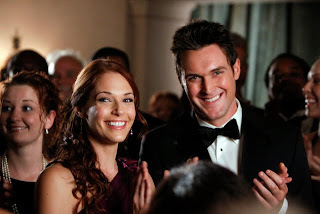 While the writers finally give in to poor lovesick Wayne Rigsby's unrequited love for Grace van Pelt as the two (played by Owain Yeoman and Amanda Righetti) tentatively embark on a relationship with consequences and complications neither was expecting, overall it's a standout season for Tim Kang's unflappable gang-banger turned agent, Kimball Cho. 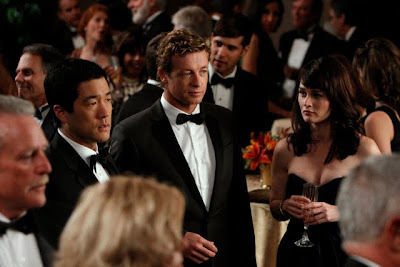 Delving into his past and future as in addition to a new love interest, Cho's old ultra-violent alliances come calling, The Mentalist ratchets up personal drama and deftly balances it with each new case as the impressive season continuously surprises us. Yet more than just presenting us with taut standalone episodes that boggle the mind, those behind the scenes earn particular admiration for paying off on certain cases several episodes later as well as sprinkling in a few new characters whom we just know will show up again either in this twenty-three episode run or the recently launched third season. While most writers would be tempted to let Jane drop his guard down now that he's been around CBI for so long, right from the start, they explore Jane's dark side. Moreover, they're none too shy in hinting that instead of a mere quest for redemption to bring villains to justice to make amends for his life as a former trickster, Jane's primary goal is to deliver deadly justice to Red John, the psychopathic serial killer who slaughtered his wife and child. And as the second season picks up from it's violent predecessor, Jane considers walking away from the California Bureau of Investigation altogether after the killer's case is assigned to Agent Sam Bosco (Terry Kinney), only to be grudgingly persuaded back to the squad by Lisbon... along with the opportunity to acquire more information about the Red John case by any means necessary. Yet in addition to Jane's reckless behavior, the risks for all involved are elevated as buffers and new watchdogs are inserted into the squad with alarming consequences to prove that no one is safe. Admittedly, at times, The Mentalist's incredible capacity for mental aerobics threatens to get the best of it as some hurdles are knocked down too quickly and subplots get lost in the shuffle in order to solve the case in forty-two breakneck minutes logic and complete understanding be damned. Yet fortunately as witnessed in this extraordinarily DVD collection, the duds are extremely few and far between. The second season of Heller's consistently compelling puzzler steps up the cases as well as the roles of the cast of characters. Thus, it challenges you to – if not – untangle the web faster than Jane than at least master your patience as you wait for the final denouement and eagerly pick out the perp all over again by moving on to the next mentally riveting episode.